Wondering what has happened to home values in the North Lake Tahoe – Truckee? Is the time right to buy, or sell a home in North Lake Tahoe – Truckee, California area? The North Lake Tahoe – Truckee real estate market conditions continue to change. Inventory levels are the lowest in more than a decade, and prices have moved up again, making sellers even more aggressive on their pricing strategies. You can see that the over-all North Lake Tahoe – Truckee home price trend is moving up, which means lower priced homes and cabins are also moving up in price. 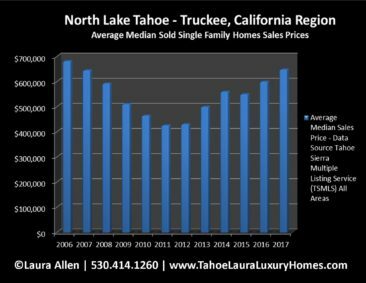 North Lake Tahoe – Truckee regional single family home prices are up +8% for 2017 when compared to 2016, with a median average sales price of $648,500. Additional confirmation on the strength of the local market can be seen in the average median home sales price as percent of sold price versus listed price. 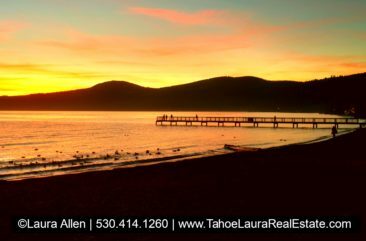 The listed price to sold price average for the median average sales price in North Lake Tahoe – Truckee area for 2017 year was 99.7 %. At almost 100%, this means Tahoe buyers that want to low-ball, or really negotiate on price are going to have a hard time in this market environment as the demand is creating a strong Sellers market. The current market trend of buyers paying almost the full listed price for properties will be hard for anyone who can’t pay full price. The days on market (DOM) has also dropped approximately -12.5%, from 96 DOM in 2016 to 84 DOM for 2017. Historically, our available homes for sale inventory levels are at their lowest during our winter months (first 3-4 months of the calendar year), then levels begin to rise as new inventory comes on the market in anticipation of the spring/summer selling season. This year is no exception, and we continue to have extremely low home inventory levels that will continue to keep prices up. Tahoe area home Buyers have had fewer choices, and for those looking for a home for sale in North Lake Tahoe, or Truckee area under $600,000 will find their options are very limited these days. What is my home worth in the North Lake Tahoe – Truckee Area? Want more long-term North Lake Tahoe – Truckee real estate data? Both the average median sales price and average sales price are included for each year in the following table. Currently we have some of the most impressive North Lake Tahoe lakefront homes and Truckee luxury properties on the market. The demand for luxury mountain homes in the North Lake Tahoe – Truckee area continues to be strong because of the very sought-after Tahoe lifestyle recreational activities this area has to offer. Want to know what is going on in the North Lake Tahoe – Truckee Condo Values | Market Report – 2017 click here. 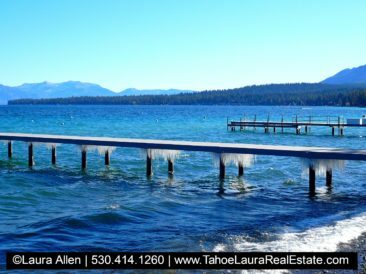 When you’re ready to buy, or sell in the North Lake Tahoe – Truckee Region, call Laura Allen, 530.414.1260, an awards level agent with Coldwell Banker the number one real estate brokerage in market share for single family homes and condos in the North Lake Tahoe – Truckee region for 2017!